Numerous recurrent genomic rearrangements have been described in a number of bone and soft tissue tumors in the last 15 years. Rearrangements of receptor tyrosine kinases (RTK) ALK, ROS1, and RET determine clinically important molecular subgroups of non-small cell lung cancer (NSCLC). About 3 % – 5 % of all NSCLCs show an ALK rearrangement, and 1 % - 2 % show ROS1 or RET rearrangements. 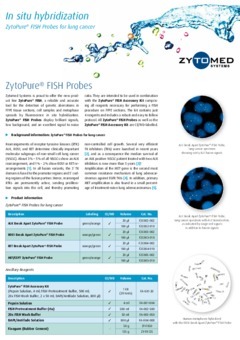 The ZytoPure FISH Probe simultaneously determines the status of the ERBB2 gene and the centromeric alpha satellite sequences of chromosome 17. 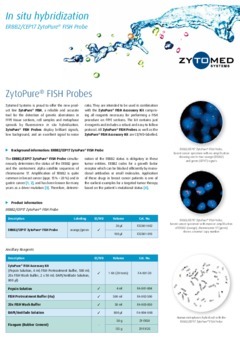 Amplification of ERBB2 is quite common in breast cancer (appr. 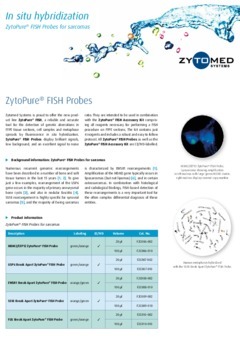 15 % – 20 %) and in gastric cancer, and has been known for many years as a driver mutation. 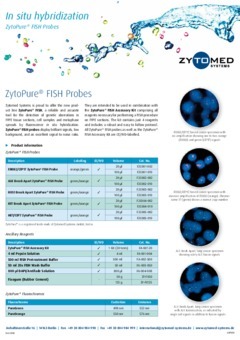 Zytomed Systems is proud to offer the new product line ZytoPure® FISH, a reliable and accurate tool for the detection of genetic aberrations in FFPE tissue sections, cell samples and metaphase spreads by fluorescence in situ hybridization.